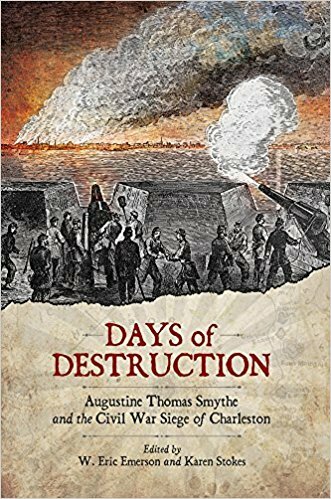 • Days of Destruction: Augustine Thomas Smythe and the Civil War Siege of Charleston edited by W. Eric Emerson and Karen Stokes (Univ of S Carolina Pr, 2017). Charleston native Augustine Thomas Smythe had quite the varied Civil War military experience. He fought at the Battle of Secessionville [if you haven't already done so, do yourself a favor and read Patrick Brennan's excellent Secessionville: Assault On Charleston ], served afloat on the C.S.S. Palmetto State, and was also posted to the Confederate Signal Corps. In performing his Signal Corps duties, he was perched high above the city inside the steeple of St. Michael’s Episcopal Church, where he was uniquely positioned to view the many land and naval actions fought around the city of Charleston and inside its contested harbor. His letters home describing these events and experiences have now been published in Days of Destruction: Augustine Thomas Smythe and the Civil War Siege of Charleston, edited by W. Eric Emerson and Karen Stokes. From the description: "The Confederate Signal Corps played a vital role in the defense of Charleston and its environs, and Smythe’s letters, perhaps more than any other first-person account, detail the daily life and service experiences of signalmen in and around the city during the war." His correspondence home offers valuable insights into "the fierce attacks on Fort Sumter, the effects of the unrelenting shelling of the city by enemy guns at Morris Island, and the naval battles and operations in the harbor, including the actions of the Confederate torpedo boats and the H. L. Hunley submarine." Like the Ripley bio referenced on the site earlier in the week, this book looks to be another highly distinctive contribution to the history of Civil War Charleston. Review of Collins - "THE ARMY OF TENNESSEE: Organization, Strength, Casualties, 1862-1865"
Darrell Collins's The Army of the Potomac: Order of Battle, 1861-1865, with Commanders, Strengths, Losses and More was published in 2013. While limited in scope and source material consulted, it remains worthy of recommendation. Though still based overwhelmingly on numbers and other information gleaned from the O.R., the author's followup volume The Army of Northern Virginia: Organization, Strength, Casualties 1861-1865 was a vast improvement in terms of organization and content. 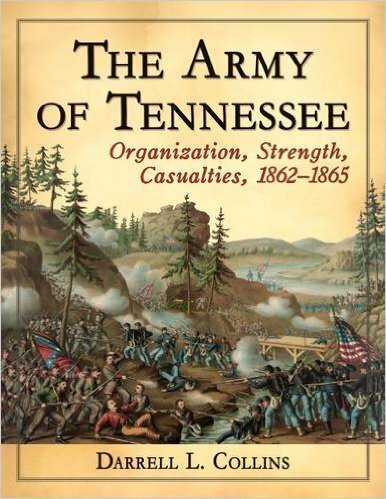 Now, Collins heads out to the western theater with his latest addition to the series The Army of Tennessee: Organization, Strength, Casualties, 1862-1865, which carries on the pattern of notable improvements first seen with the ANV volume. As with the ANV book, The Army of Tennessee is divided into three main sections—I. Organization Reports, II. Present for Duty Reports, and III. Casualty Reports—with various subsections. Officially formed on November 20, 1862 after the unsuccessful conclusion of the Kentucky Campaign, the Army of Tennessee was the Confederacy's chief field army in the western theater and the successor organization to the ill-starred Army of Mississippi/Army of the Mississippi. 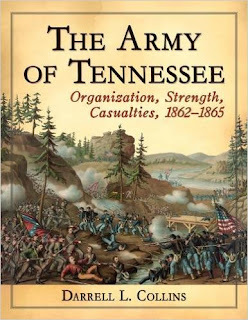 Because the new army was composed of various sub-elements that came and went throughout 1862, the author understandably chose to begin his organizational history back in early 1862, dealing first with those foundation pieces that would later serve as the Army of Tennessee's core units. Beginning on January 31, 1862 and concluding on April 9, 1865, Section I provides army orders of battle in the traditional descending level format (army► corps► division► brigade► regiment/battalion► artillery battery). These full OBs are provided at intervals ranging from weeks to months. Part I gives a further nod to researchers by offering 'commander timelines' for each of the unit types mentioned above. Using these subsections, readers can readily discover who was in command of any given unit at any given time. The first part of Section II consists of 1862-1865 army present-for-duty (PFD) numbers arranged in eight columns [headings for unit name, effective officers, effective men, effective total, total present, present and absent, % present, and guns]. These are generally presented at brigade level and higher, although regimental PFD figures are seen with some frequency as are gun compositions for the artillery batteries. This is followed by another series of tables for army, corps, and division strength data (also presented in eight columns) for a long list of specific dates. Section III tabulates casualty reports (against mostly at a higher organization level) in seven columns [headings for unit name, number present, KIA, WIA, MIA, total, and casualty %] beginning at Fort Donelson and ending with the Battle of Bentonville. As is the case in many other sections of the book, the amount of data and information available varies widely for different dates and from battle to battle. The volume concludes with separate indexes for unit and commander names. In creating The Army of Tennessee, author Darrell Collins has again effectively mined the Official Records for reference data related to a major Civil War army and helpfully arranged this great mass of information into easily accessible tables. Wary readers will recognize the limitations of the available information (there are many gaps) as well as the pitfalls of relying solely on the O.R. as a source, but this army reference guide will serve as a valuable research starting point. • Resolute Rebel: General Roswell S. Ripley, Charleston's Gallant Defender by Chet Bennett (Univ of S Carolina Pr, 2017). Like a number of his army colleagues, Ohio-born West Pointer and U.S.-Mexican War veteran Roswell Ripley married into a southern family and transferred his sectional sensibilities in that direction as well. When secession and Civil War came, he joined the Confederate Army and fought Union forces in Virginia, Maryland, and along the South Atlantic coast. His service was eventful and not without controversy, with his Charleston commands drawing much criticism from leading politicians and fellow military figures. 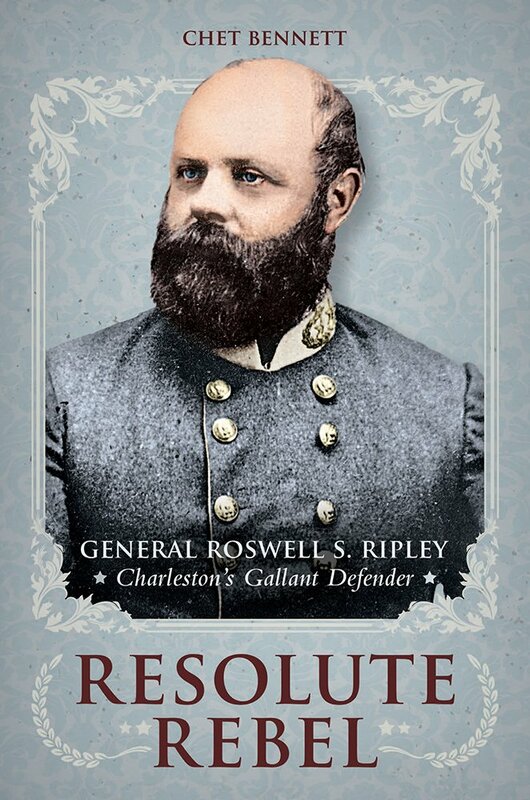 History has passed down a fairly negative view of Ripley, and Chet Bennett's new biography Resolute Rebel: General Roswell S. Ripley, Charleston’s Gallant Defender "strives to paint a more balanced picture of the man and his career." In addition to detailing Ripley's antebellum and Civil War military service, the book also explores Ripley's other endeavors as published author, engineer, arms merchant, and inventor. After the Confederacy's fall, Ripley fled to England. There, "he unsuccessfully attempted to gain control of arms-manufacturing machinery made for the Confederacy, invented and secured British patents for cannons and artillery shells, and worked as a writer who served the Lost Cause." More from the description: "After twenty-five years researching Ripley in the United States and Great Britain, Bennett asserts that there are possibly two reasons a biography of Ripley has not previously been written. First, it was difficult to research the twenty years he spent in England after the war. Second, Ripley was so denigrated by South Carolina’s governor Francis Pickens and Gen. P. G. T. Beauregard that many writers may have assumed it was not worth the effort and expense. Bennett documents a great disconnect between those negative appraisals and the consummate, sincere military honors bestowed on Ripley by his subordinate officers and the people of Charleston after his death, even though he had been absent for more than twenty years." While offering a fresh reappraisal of Ripley's life and military career, the book should also serve as a very useful addition to the Civil War Charleston historiography. 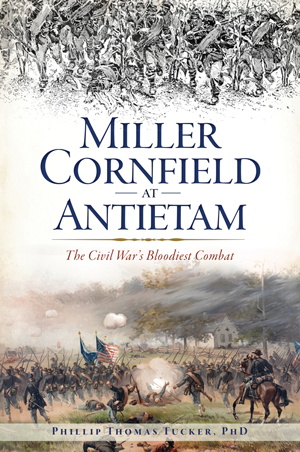 • Miller Cornfield at Antietam: The Civil War's Bloodiest Combat by Phillip Thomas Tucker (Arcadia Pub & The Hist Press, 2017). The Miller Cornfield and the Sunken Road are perhaps the two most iconic places on the Antietam battlefield in Maryland. Throughout the morning hours of September 17, 1862, determined attacks and counterattacks swept back and forth across the Miller Cornfield, carpeting the entire area with casualties from both sides. Miller Cornfield at Antietam details this phase of the battle, with a special focus on the men and exploits of Hood's Texas Brigade, and to a somewhat lesser degree the Union army's Iron Brigade. A theme of the book is that the truly elite combat units from both sides were drawn from the western fringes of America, from the harsh Southwest borderland to the recently settled wilds of Wisconsin and Michigan. 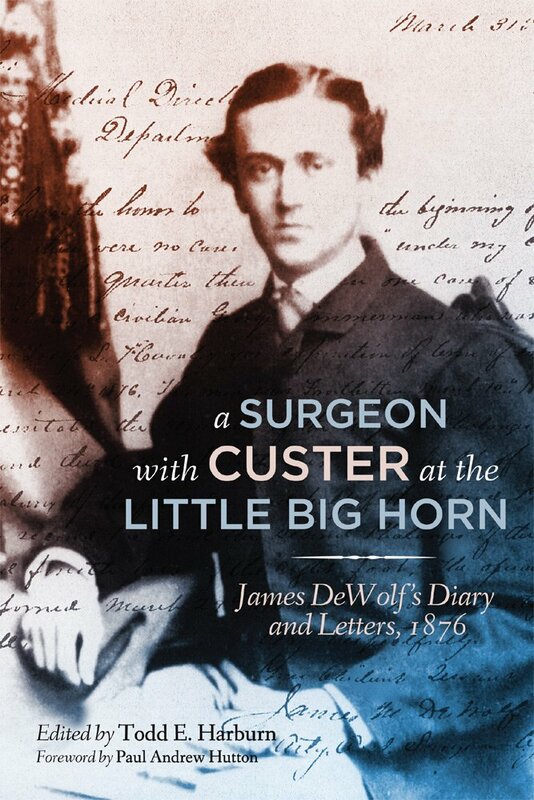 • A Surgeon with Custer at the Little Big Horn: James DeWolf's Diary and Letters, 1876 by James Madison DeWolf, edited by Todd E. Harburn (OU Press, 2017). "In spring 1876 a physician named James Madison DeWolf accepted the assignment of contract surgeon for the Seventh Cavalry, becoming one of three surgeons who accompanied Custer’s battalion at the Battle of the Little Big Horn. Killed in the early stages of the battle, he might easily have become a mere footnote in the many chronicles of this epic campaign—but he left behind an eyewitness account in his diary and correspondence. A Surgeon with Custer at the Little Big Horn is the first annotated edition of these rare accounts since 1958, and the most complete treatment to date." More from the description: "In letters to his beloved wife, Fannie, and in diary entries—reproduced in this volume exactly as he wrote them—DeWolf describes the terrain, weather conditions, and medical needs that he and his companions encountered along the way." "After DeWolf’s death, his colleague Dr. Henry Porter, who survived the conflict, retrieved his diary and sent it to DeWolf’s widow. Later, the DeWolf family donated it to the Little Bighorn Battlefield National Monument. Now available in this accessible and fully annotated format, the diary, along with the DeWolf’s personal correspondence, serves as a unique primary resource for information about the Little Big Horn campaign and medical practices on the western frontier." Editor Todd Harburn adds biographical details on DeWolf's life in the introduction. He also enhances the value of this new edition of DeWolf's writings with extensive explanatory endnotes. Maps and photos are placed throughout the volume, and additional materials in the appendix section include some account book pages from DeWolf's diary, a collection of pre-LBH campaign diary pages from 1875, and the introduction to the 1958 edition. Review of Michno - "THE THREE BATTLES OF SAND CREEK: In Blood, in Court, and as the End of History"
Rivaling Fort Pillow in its controversial nature, the alleged massacre of ostensibly peaceful Cheyenne and Arapaho at Sand Creek by Colorado volunteers in November 1864 spawned national outrage. Studies of the event, most recently Ari Kelman's A Misplaced Massacre (2013) and the 2014 essay collection Battles and Massacres on the Southwestern Frontier, have generally concluded that the action was indeed more massacre than battle. 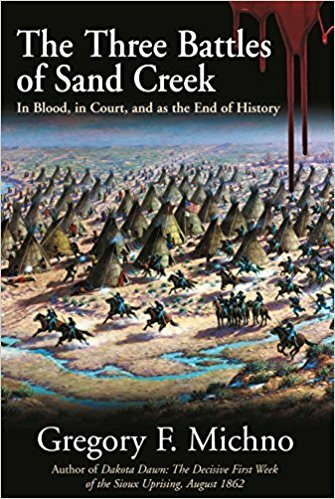 Wading into this tangled, and arguably unresolvable, debate is Greg Michno's The Three Battles of Sand Creek: In Blood, in Court, and as the End of History. As the title suggests, Michno divides his study into three parts. Part I recounts at some length the actual fighting at Sand Creek, and Part II examines the three official investigations into the event. Part III cites modern research into eyewitness testimony, false memories, memory alteration, lying, cognitive dissonance, and oral history tradition and looks at how all of these and more cloud, and even defy, our understanding of Sand Creek. Contained in Part I and comprising roughly half the book's content, Michno's account of the November 29, 1864 attack by Colorado volunteers (the new 3rd regiment, and part of the 1st Colorado) led by Colonel John M. Chivington on Cheyenne and Arapaho camps located along Sand Creek is a fine rendering of events from the available evidence. This section also delves into the event's tragically confused origins, importantly setting the context of the attack within the explosive climate of fear in Colorado created by a panicked reaction to an unusually bloody season of Indian raids along the Platte River and upon numerous settler ranches (most infamously the June 11, 1864 murder and mutilation of the Hungate family a short distance east of Denver) and wagon trains. Many writers and historians characterize the Camp Weld conference as leading to a peaceful understanding between Colorado authorities, the military, and attending tribal groups like the Cheyenne bands of Black Kettle, White Antelope, and others. Like other dissenters, Michno instead finds that Camp Weld created more misunderstanding than anything else, with each faction taking away a different interpretation of what had occurred. Seeking winter peace after a season of raiding (and getting government food and supplies in the bargain) was also a well-recognized tribal tactic designed to gain respite from retaliation during their most vulnerable months before returning to raiding in the spring and summer. There's also the question of individuals at the conference making promises they had no authority to make. Michno's account of the Sand Creek attack itself is perhaps the most detailed and insightful one available. Contrary to popular belief, the Colorado volunteers did not conduct a mounted charge into the Indian camps, which were spread along the creek bed and not in a compact circle as many have asserted. The defenders were not caught in their tepees (another misconception), and Colorado casualties were far higher than the traditional numbers have indicated [Appendix B lists the names and wound details of 76 men (24 KIA and 52 wounded) of the 1st and 3rd Colorado at Sand Creek, a huge disparity over the 10 killed and 38 injured cited most recently in the Battles and Massacres volume referenced above, with the large percentage of arrow wounds discounting friendly fire theories]. The slow development of the attack, which converged on the villages from multiple directions, gave most of the Indians time to either move up the creek or escape altogether. Most of the close range fighting occurred in isolated pockets north of the camps, with the Indian defenders improvising foxholes from the creek bed's sandy banks. Sporadic fighting continued overnight, but renewed pursuit by Chivington's men on the 30th was largely uneventful. Part II covers the three official investigations of the Sand Creek affair—the Denver military commission, an investigatory commission of the Joint Committee on the Conduct of the War, and the Doolittle Commission. From Michno's description of their proceedings, it appears that none were procedurally set up to render an impartial judgment. All three commissions assumed from the beginning that an outrageous massacre occurred (the very question that needed to be answered, not used as the starting point of the investigation), badly prejudicing all that would follow. Given the bad blood between the officers of the 1st and 3rd Colorado regiments, it could hardly have been worse for Chivington that the Denver commission was run by officers from the 1st Colorado and headed by an avowed Chivington enemy in Samuel Tappan. All of the witnesses called to testify by Tappan's court were hostile, and Chivington's legal team's objections over the introduction of what they believed to be illegal and irregular testimony were mostly overruled. The Joint Committee's investigation was a similarly damning proceeding, with witnesses being asked leading questions and no person from the 3rd Colorado called to testify. According to Michno, the committee was particularly affected by, and accepted with apparently little question, the unsworn affadavit of Major Wynkoop, which was full of falsehoods and hearsay (Wynkoop wasn't even present at the battle/massacre). Finally, a Joint Special Committee under Senator James Doolittle was tasked with probing government treatment of all the tribes living across the vast American West. The portion of this investigation pertaining to Sand Creek interviewed 30 individuals, over half of whom were not present at the incident under question. Some testimony (notably that of Samuel Colley) changed from that given before, and several affadavits were again composed of secondhand information. In one eye-opening Part II chapter, Michno produces a long list of testimony excerpts demonstrating the pervasiveness of contradictory and altered eyewitness memory. In the author's estimation, this comprises an insurmountable challenge for historians trying to answer even the most basic questions regarding Sand Creek [Was peace made before Sand Creek? Were the Indians under army protection? Were there flags in the Indian camp? Were the Indians scalped and mutilated? Were there white scalps in the village? and more]. Given the situation, the author feels that trying to discover the 'truth' of Sand Creek to be essentially "an exercise in futility and frustration" (pg. 162). Michno makes a strong case that labeling Sand Creek either a battle or a massacre is a false dichotomy. In reviewing his own findings as well as the most recent literature from historian Ari Kelman and battlefield archaeologist Douglas Scott, it is clear that enough evidence exists to assemble a reasonably persuasive supporting argument either way, but is doing so good history? Seeing the book's photograph of the entrance sign to the NPS's Sand Creek Massacre National Historic Site, one might think that history itself and the teaching mandate of the NPS both would have been better served by calling it the Sand Creek National Historic Site, with contextual exhibits discussing the merits of the battle and massacre arguments inside the visitor center rather than so starkly coloring the views of visitors from the moment they step onto the grounds. The rest of the book (Part III) is an often fascinating examination of the general (and often frightful) unreliability of eyewitness accounts of events and the many factors that go into memory forming. The section cites modern research along the way and applies those findings to the various questions and controversies surrounding Sand Creek. The challenges of accepting oral history as valid evidence are also discussed. What is truth if no two witnesses see the same thing and all memory is malleable from the very beginning? Events of profound stress like Sand Creek, when parties also view themselves as victims of the diabolical acts of others, complicate matters even more. One can argue that this is a well-recognized problem common to all historical investigation, but perhaps Sand Creek does take it to another level. In terms of the "end of history," Michno posits that, using Sand Creek as an example, we might be witnessing the complete breakdown of the classic Hegelian dialectic of history, with the level of cognitive dissonance in modern society so powerful that synthesis is no longer possible between the current thesis and the antithetical reaction to it. Complaints with the book mostly center around presentation, with the text containing a superabundance of typos. There are so many myths and controversies attached to Sand Creek that it's probably inevitable that more than a few would be left out. Notable omissions include allegations that drunkenness was widespread in Chivington's command prior to the attack and that his men publicly exhibited body part trophies on their return to Denver. Perhaps feeling the topic outside the scope of his study, the author also chooses not to enter the current debate over whether events like Sand Creek that occurred between 1861 and 1865 should be considered part of the Civil War. At the time, more than a few individuals tried to attach blame to Confederate agents for stirring up Indian troubles during the conflict, especially those that occurred along the main emigrant trails and avenues of military transport and communications in the Trans-Mississippi West. In trying to discover what really happened at Sand Creek on that terrible November day in 1864, Michno doesn't find the battle vs. massacre debate very fruitful and doesn't try to convince readers one way or another. What his book does do very effectively is prompt the thinking reader to question prior assumptions (especially those many consider already settled) and perhaps come to the conclusion that the available evidence paints a far more complicated and contradictory picture than the one handed down to us in the literature. 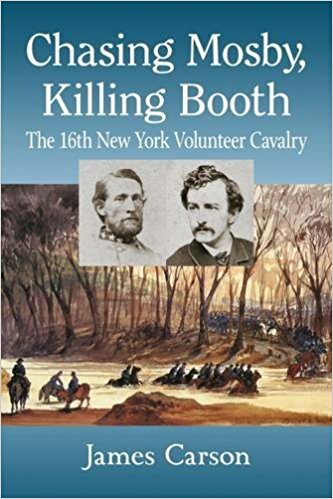 • Chasing Mosby, Killing Booth: The 16th New York Volunteer Cavalry by James Carson (McFarland, 2017). From the description: "An amalgam of three partially formed regiments, the 16th was plagued by early desertions, poor leadership and a near mutiny as its First Battalion prepared to march to northern Virginia to bolster the outer defenses of Washington in October 1863. The regiment spent most of the remainder of the war chasing Mosby's cavalry. They won a few tactical victories but were mainly confounded by the Confederate guerrillas." In addition to its service narrative of the 16th NY, Chasing Mosby, Chasing Booth contains an officer & NCO biographical roster (including a detailed entry for Booth killer Boston Corbett). A superficial glance at the bibliography reveals a promising source scope and range, with manuscript research from primarily NY-based collections but also numerous government archives and records. "Near the end of the Civil War, Army Chief of Staff Henry W. Halleck described the 16th New York Volunteer Cavalry as 'cowed and useless' after they were 'cut up' by Confederate Colonel John Mosby's Rangers." However, "(t)he following April the New Yorkers made their place in history when 26 men led by Lieutenant Edward P. Doherty captured and killed John Wilkes Booth." The regiment's strong links to two of the most popular topics in Civil War lore (Mosby's Confederacy and the Lincoln assassination) should add to the book's appeal. • Jefferson Davis's Final Campaign: Confederate Nationalism and the Fight to Arm Slaves by Philip D. Dillard (Mercer UP, 2017). With Confederate armies and the home front both teetering on collapse by November 1864, President Jefferson Davis "called on Congress to reconsider the role of the slave in the Southern war effort. His goal was not simply to find more men for Lee's army but rather to create a new Confederate identity based in the experience of war rather than in the shadows of the Old South." Philip Dillard's Jefferson Davis's Final Campaign examines the debate over arming slaves "as it unfolded in Virginia, Georgia, and Texas," his research finding distinct "differences between the Upper South, Deep South, and Trans-Mississippi South." "Davis waged his final campaign in newspapers as he challenged the Southern people to define a new role for the slave. Discussion of black men in gray uniforms brought forth long-hidden divisions between planters, yeoman, and poor whites. By looking for common Southerners who held neither high government office nor military position, this work paints a more complex picture of the importance of slavery within the Civil War South." According to Dillard's findings, by spring 1865 "(t)he vast majority of Virginians, Georgians, and even some Texans discovered that slavery could be sacrificed more easily than Southern independence." 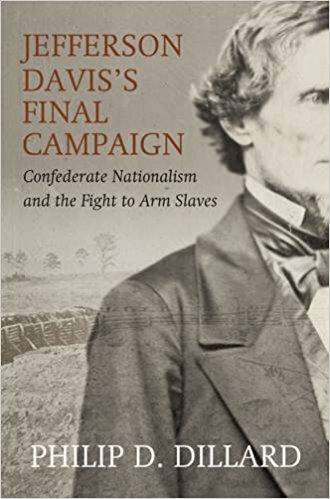 Though the last-ditch effort to revive and redirect Confederate nationalism to save the nation proved meaningless in the context of staving off defeat, Davis "won his final campaign by convincing many Southerners that the Confederate nation was more important than the institution of slavery." 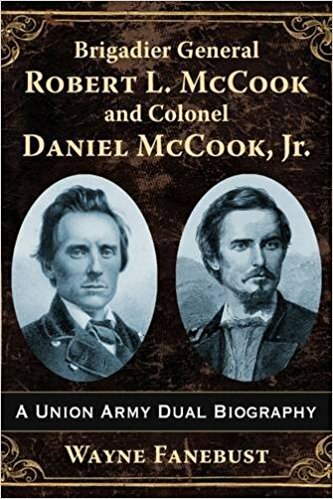 Booknotes: Brigadier General Robert L. McCook and Colonel Daniel McCook, Jr.
• Brigadier General Robert L. McCook and Colonel Daniel McCook, Jr.: A Union Army Dual Biography by Wayne Fanebust (McFarland, 2017). "A veteran of Shiloh and Chickamauga, Colonel Daniel McCook was mortally wounded while leading his brigade in a reckless assault up Kennesaw Mountain in June 1864, on the orders of his friend and former law partner General William Tecumseh Sherman." and "Brigadier General Robert L. McCook distinguished himself in the western Virginia campaign before he was shot by a Rebel while riding in an ambulance in the summer of 1862. His death, in what was an apparent ambush, set off a firestorm of outrage throughout the North." The bibliography contains a large selection of newspapers but few manuscript collections, with the notes primarily citing the O.R. and a variety of published sources. In addition to the dual biography sections, there's a fairly extensive chapter on the trial and legal travails of Confederate captain Frank Gurley, who was convicted by a military court of McCook's murder. Sentenced to death, he was in limbo before finally being released in 1866.
Review of Jordan - "HIDDEN HISTORY OF CIVIL WAR SAVANNAH"
By its own description, The History Press's Hidden History series "treats history lovers to a closer look at some of the lesser known events and stories all too often overshadowed by the bigger headlines..." and invites them to "(s)tart exploring the nooks and crannies of America’s rich history, one city, town, and neighborhood at a time." 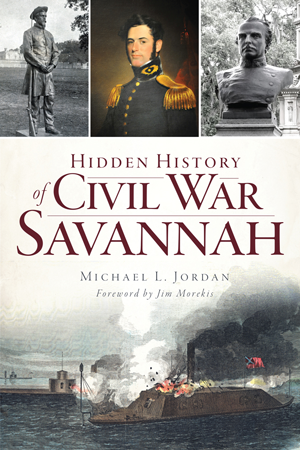 One of the newest volumes from the series is Michael Jordan's Hidden History of Civil War Savannah. Jordan begins with the famous Savannah oration (later known as the "Cornerstone Speech") by Confederate Vice-President Alexander Stephens. Like other have done (and it's the primary reason why the speech is remembered today), the author zeroes in on those sections comprising Stephens's emphatic defense of slavery and the institution's centrality to the social order of the breakaway republic. The chapter most biographical in nature examines the life and death of Savannah attorney and Confederate colonel Francis S. Bartow. An ardent secessionist who repeatedly clashed with Georgia's Governor Brown over taking state volunteers beyond its borders, Bartow was killed leading a brigade at First Manassas. Jordan also discusses Bartow's status as one of the Confederacy's earliest 'martyrs' and makes note of the monuments erected in his honor. Another individual-themed chapter spotlights Robert E. Lee's professional association with Savannah, first as a U.S. Army engineer officer constructing fortifications and later as a Confederate department commander for several months (though, for the latter, the author might have related to readers a richer appreciation of the regional defense strategy devised by Lee that served the Confederacy so well from 1862 onward). One of the finest chapters relates the service history of the ironclad CSS Atlanta, from its origins to its grounding and surrender during the 1863 Battle of Wassaw Sound. The battle action is described in fine detail, and the chapter also perceptively highlights some of the challenges and controversies of Confederate harbor defense plans. Savannah was threatened by sea throughout the conflict, but the ravages of war were most directly visited upon the city when Savannah was selected as the terminus of William T. Sherman's famous "March to the Sea" in 1864. One chapter recounts the strain that the mass influx of Union POWs into Savannah ahead of the Union advance placed on local resources, and another follows the successful evacuation of Savannah's military defenders when Sherman's army finally approached the city gates. Jordan also looks at the cooperation between city officials and Union occupiers, which occurred at a rapidity and scale that many Confederate newspapers angrily deemed unseemly and unpatriotic. The little known history of a fire that destroyed a large part of the town in January 1865 is also discussed, with no conclusions drawn regarding responsibility (though one might think the event's timing—it occurred shortly before the commencement of the Union march north through the Carolinas—more than a little suggestive of the pattern of incendiary behavior practiced by elements of Sherman's army). The book's final chapter is also one of the better ones in the collection. Citing all the usual problems and disputes over design, funding, and placement, it recounts the long journey to completion of Savannah's impressive granite memorial to its Confederate dead. Like the Hidden History series as a whole, the book is targeted more toward the general reading audience of local history enthusiasts, but it is far from history-lite. The research appears more than solid [though occasional gaffes appear, like repeating the persistent old myth of Lee turning down "supreme command of all Union ground forces at the beginning of the war" (pg. 42)], the text is sourced, and the author writes historical narrative very well. The volume is also abundantly illustrated, with its collection of photographs particularly noteworthy. Each chapter can be likened to an article one might find in the pages of the better popular history magazines. Given the general dearth of studies devoted to the coastal South Atlantic front, it would be interesting to see what the author might come up with in terms of researching and writing a long form historical manuscript. Congratulations are in order for Daniel Crofts. His book Lincoln and the Politics of Slavery: The Other Thirteenth Amendment and the Struggle to Save the Union (UNC Press, 2016) was announced on Monday by the Nau Center as the 2017 winner of the Bobbie and John Nau Book Prize in American Civil War Era History. 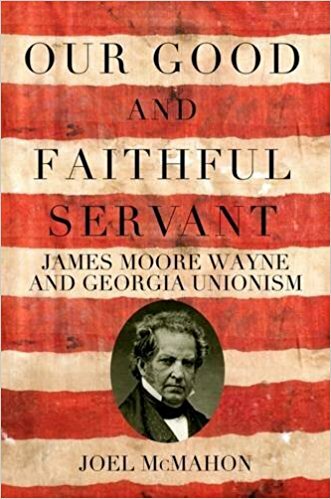 • Our Good and Faithful Servant: James Moore Wayne and Georgia Unionism by Joel McMahon (Mercer UP, 2017). United States Supreme Court Justice James Moore Wayne of Georgia refused to follow his home state out of the Union and kept his seat on the bench. In a situation repeated across the South (see Peter Carmichael's The Last Generation), Justice Wayne's son, Henry Wayne, opposed his father's conservative pro-Union views and was radicalized by the secession movement, resigning his U.S. Army commission and joining the Confederate armed forces. "This book tells their story and examines the nature of Georgia's strong and largely overlooked unionist sentiment in the decades before the Civil War." Like an increasing number of scholarly studies of southern unionism, Our Good and Faithful Servant uses the Wayne family history to drill deeply into the "economic, political, and social dimensions of unionism in the state of Georgia." • Ordered West: The Civil War Exploits of Charles A. Curtis edited by Alan D. Gaff and Donald H. Gaff (UNT Press, 2017). During the Civil War, Charles A. Curtis was a quartermaster with the 5th U.S. Infantry, serving on the Desert Southwest frontier from 1862 to 1865. His memoir of that experience appeared in serial form in the Montpelier, Vermont newspaper Argus and Patriot, released in three installments published between 1877 and 1880 under the title "Army Life in the West." The first two were supported by Curtis's contemporary notes, but the last was reconstructed from memory with details less reliable. Through the efforts of Alan and Donald Gaff, the memoir has been rediscovered and is now available in book form for the first time. Their editorial intervention is intentionally gentle, generally limited to "arranging the narrative into chronological order, eliminating duplicate material, and removing a few anachronisms." From the description: "Annotated with footnotes identifying people, places, and events, the text is lavishly illustrated throughout with pictures of key figures and maps. A detailed biographical overview of Curtis and how his story came to print is also included." The footnotes are explanatory in nature and appear with moderate frequency throughout the text. 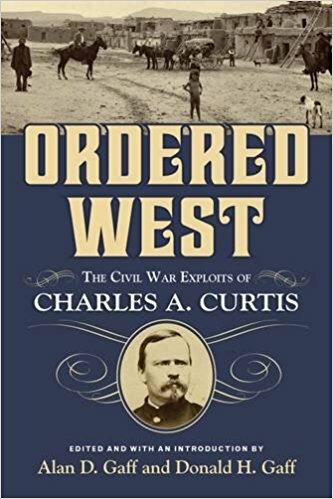 According to historian Jerry Thompson, who would know such things perhaps more than any other scholar, the Curtis memoir "has to be one of the most significant documents relating to the history of the army in the Southwest to be uncovered in the last several decades." More from the description: "In addition to his keen observations of daily life as a soldier serving in the American Southwest, Curtis’s reminiscences include extensive descriptions of Arizona and New Mexico and detail his encounters with Indians, notable military figures, eccentrics, and other characters from the Old West. Among these many stories readers will find Curtis’s accounts of meeting Kit Carson, the construction of Fort Whipple, and expeditions against the Navajo and Apache." Review of Flannery - "CIVIL WAR PHARMACY: A History, Second Edition"
Hopefully, the studies of Civil War surgery and medicine published over the past few decades have helped dispel the popular myth of army surgeons as incompetent sawbones largely immune to scientific curiosity and progress. On the other hand, in contrast to the many fine published works on Civil War medicine and surgery, just about everything related to pharmacy—the drugs; the persons and firms involved in the development, manufacture, and distribution of therapeutics; and the duties and challenges of those that dispensed these chemical and botanical agents directly to the soldiers in the field—has been less well represented in the literature. Michael Flannery's Civil War Pharmacy (2004) went a considerable distance toward bridging the gap, but new scholarship, along with some omissions noted by reviewers, has led Flannery to update his award-winning book. The resulting Civil War Pharmacy: A History, Second Edition incorporates current work in the field while also adding two new chapters on battlefield pharmacy and naval pharmacy. In 1861, there were only six established schools of pharmacy in the U.S. As a regulated profession, pharmacy was in its infancy, as was the pharmaceutical industry as a whole. Most pharmacists prepared their own remedies and learned their craft through apprenticeship (or were self-taught). Even so, Flannery contends, with some justification, that the pharmacy trade and practice in the country were not as backward in comparison to their western European counterparts, and domestic drug manufacturing much more complex, than the more dismissive critics have asserted. The author also cites in his introductory section noticeable regional differences in antebellum American pharmacy. Predictably, production was even more scaled-down and dispersed in the South than in the North, but most readers would probably be surprised to learn that several southern states were pioneers in regulatory law. The book fully describes the official duties and responsibilities of those within the army tasked with ordering and maintaining drug supplies and distributing them to the soldiers in the field. Of these two positions—medical purveyor and medical storekeeper—the latter were by 1862 law tested for both pharmaceutical knowledge and business management acumen prior to appointment. Wider were the duties of hospital steward. Over time, these bled into almost every aspect of army hospital and surgical care, but pharmacist was the post's chief responsibility. One steward was attached to every general hospital as well as to each company in the field (although approved numbers were never achieved and less than a handful were typically assigned to each regiment). Through national aid organizations like the U.S. Sanitary Commission, women played a key role in raising funds for the purchase of drugs and medical supplies. Supplementing medicines obtained through official army channels, these additions to the pharmacopeia were a godsend to the sick and wounded. Flannery also presents evidence that female nurses and volunteers, though faced with strong opposition from Union army surgeons and hospital stewards, were involved in drug preparation, dosing, and administration. Many also applied their own experiences in home remedies to the benefit of grateful soldiers. As the book shows, the Confederacy's lack of a similar national aid organization meant that its own sick and wounded were placed at a significant disadvantage in comparison. Flannery's research led him to the conclusion that pharmaceutical manufacturing and distribution in the North were both efficient and adequate to the needs of the army. According to the author, fears that government labs would stifle private industry proved to be unfounded, and there's little data to support allegations of price fixing and war profiteering even when, in the case of quinine, only two firms were responsible for essentially the entire supply. Citing considerable evidence, the book marks the year 1863 as the turning point in the South's ability to meet its pharmaceutical needs. Until that time importation and native manufacturing were sufficient, but the tightening of the blockade and the failure to find native substitutes meant that the disparity in sickness levels between Union and Confederate regiments widened even further. While plagued by nutritional deficiencies not suffered by their Union opponents (which resulted in debilities almost unique to Confederate soldiers, like pellagra and night blindness), the author is generally impressed with Confederate efforts to maintain the health of its soldiers with far less resources available. Making the procurement challenge even more difficult, the drugs that did make it through the blockade also had to serve the civilian population. The officially approved medicine chest for the armies contained a long list of manufactured and plant-based agents ranging from highly beneficial to downright harmful. Several figures and tables catalog these therapeutics, but Flannery wisely limits his most detailed analysis to those drugs used to treat the most common ailments (diarrhea, dysentery, fevers, respiratory illnesses, and digestive problems). The book contains a long and useful discussion of the procurement, manufacture, and efficacy of quinine preparations, which were truly effective against malaria but also misused as a kind of general therapy. The popular view of Civil War hospitals being helpless in the face of infection is successfully challenged by the book's well documented account of the startling effectiveness of bromine and iodine disinfectants (especially the former) in reducing post-operative mortality and managing wound infections. This revealing look at disinfectants is the salient feature of the Second Edition's new chapter on battlefield medicine. The surgical anesthesia section is also quite good. While appropriately noting widespread institutional stubbornness when it came to using mercury-based products, Flannery does cite a small core of enlightened opposition within the army. The author singles out for special recognition one brave dissenter in particular, Union Surgeon General William A. Hammond, who was court-martialed and cashiered for directing the army to remove mercury from its medicine chest. The new navy chapter is largely descriptive in nature, with little discovered in the way of distinctive differences between army and naval pharmacy. It does praise (appropriately, it seems) the efficiency of the naval laboratory, which preceded the army's facility by a decade. Problems emerged here and there during the war, but the well-established Bureau of Medicine and Surgery and its lab together did a fine job of meeting the significant challenges of supplying and managing the pharmaceutical needs of the Union Navy's far flung fleets. Flannery's contention that the war was a key event in the wider development of the pharmaceutical industry in the U.S., with many individuals involved in wartime research and production becoming household names by their association with the many eponymous firms that would rise to prominence in the following decades, is a persuasive one. Unlike the small arms industry, the drug companies were able to maintain and even expand their wartime economies of scale. The book makes scant mention of Civil War connections to the parallel post-war patent medicine industry boom, but it's likely the author felt such a large tangential topic outside the scope of this study. Michael Flannery's Civil War Pharmacy represents a very thorough introduction to a significant and often misunderstood topic. On a macro level, the book effectively charts the evolution and economic transformation of the pharmaceutical industry before, during, and after the Civil War. At the ground level, the study affords readers a detailed picture of the organization and practice of pharmacy in the Union and Confederate armies and navies. The roles of several of the war's most significant therapeutic agents are discussed at length, and many prevailing beliefs and myths convincingly challenged. This volume is a very important addition to the Civil War medical literature, but it is also hoped that a wider readership will be exposed to the book's many corrective features regarding the nature of Civil War pharmacy and the progressiveness of its practitioners. • The Army of the Potomac in the Overland and Petersburg Campaigns: Union Soldiers and Trench Warfare, 1864-1865 by Steven E. Sodergren (LSU Press, 2017). 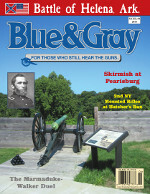 An increasing number of scholars, among them Earl Hess and Carol Reardon, have examined the 1864 transition from episodic battles to continuous fighting and widespread trench warfare on the two main fronts in Georgia and Virginia. 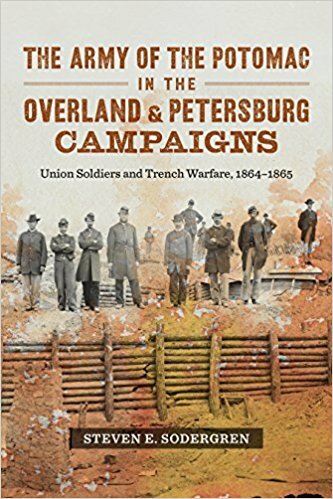 "In The Army of the Potomac in the Overland and Petersburg Campaigns, Steven E. Sodergren examines the transition to trench warfare, the lengthy campaigns of attrition that resulted, and how these seemingly grim new realities affected the mindset and morale of Union soldiers." In the wake of the devastating losses suffered during the Overland Campaign, "surviving Union soldiers began to express considerable doubt in their cause and their leaders, as evidenced by widespread demoralization and the rising number of men deserting and disobeying orders." However, far from accelerating the decline in the fighting elan of the Army of the Potomac, the Richmond-Petersburg Campaign instead revived the men in the ranks. "Comprehending that the extensive fortification network surrounding them benefitted their survival, soldiers quickly adjusted to life in the trenches despite the harsh conditions. The army’s static position allowed the Union logistical structure to supply the front lines with much-needed resources like food and mail—even a few luxuries. The elevated morale that resulted, combined with the reelection of Abraham Lincoln in November 1864 and the increasing number of deserters from the Confederate lines, only confirmed the growing belief among the soldiers in the trenches that Union victory was inevitable." Because of this, according to Sodergren, the Army of the Potomac was able "to emerge with a renewed sense of purpose as fighting resumed on the open battlefield in 1865." • Hidden History of Civil War Savannah by Michael L. Jordan (Arcadia Pub & The History Pr, 2017). The "Hidden History" non-fiction series of books from The History Press are episodic collections of local history lore. Michael Jordan's look at Savannah's Civil War history begins with Alexander Stephens's famous "Cornerstone" speech. From there, the book explores the life of Savannah resident Francis Bartow, recounts Robert E. Lee's time spent in the city, describes the naval actions of the ironclad CSS Atlanta, chronicles the Union POW experience in Savannah, and discusses the 1864 evacuation. The final two chapters investigate the sources responsible for the destruction visited upon the city post-surrender and Savannah's Confederate memory past and present. 1. Army of the Potomac: McClellan's First Campaign, March - May 1862 by Russel H. Beatie (2007). I usually reserve the first spot for some kind of overview, but existing ones from Sears (1992) and Cullen (1973) never really set the bar very high from the start [I've also had a lengthy, self-published study from a fellow named Rudolph Schroeder on my hard drive since 2009 but never really looked at it]. Instead, I decided to go with Beatie Vol. 3's engrossing (and uniquely, if idiosyncratically, expansive) Union high command analysis of the early stages of the campaign through the Battle of Williamsburg. 2. The Battle of Seven Pines, May 31-June 1, 1862 by Steven Newton (1993). The modern Peninsula literature is very strange in that worthwhile book length accounts exist for some of the smaller battles [among them Williamsburg in A Pitiless Rain (1997) and The Battle of Hanover Court House (2006)] and even mere skirmishes [with The 4th Michigan Infantry At The Battle Of New Bridge, Virginia (2007)], but studies of the major battles have largely escaped the interests and attention of talented military historians [some attempts have been ghastly failures, but Douglas Crenshaw's slim study of Glendale is an exception]. Part of the Virginia Civil War Battles and Leaders series from H.E. Howard, Newton's The Battle of Seven Pines (1993) is not a model study of a Civil War battle by any means, but I wanted to include a standalone account of the fighting at Fair Oaks and Seven Pines and it's the best available. 3. Extraordinary Circumstances: The Seven Days Battles by Brian K. Burton (2001). Blowing away all previous attempts, Burton's book is not only the finest overall account of the crucial Seven Days 'campaign within a campaign,' but it also contains the literature's richest treatments for each battle fought during the week-long series of events, from Oak Grove through Malvern Hill. 4. The Richmond Campaign of 1862: The Peninsula and the Seven Days edited by Gary W. Gallagher (2000). Part of the classic Military Campaigns of the Civil War series, this collection of nine essays largely focuses on battles and leaders, with two chapters also exploring the campaign as a key moment in the advent of hard war and the destruction of slavery. Another collection of scholarly essays, this book trilogy is even more closely devoted to military affairs. Under that umbrella, topical range is rather diverse, to include unit studies, battle accounts, high command commentary, leadership analyses, and diary/journal extracts to go along with examinations of logistics, medical services, and weather. • The Forgotten Irish: Irish Emigrant Experiences in America by Damian Shiels (The Hist Pr Ireland, 2017). 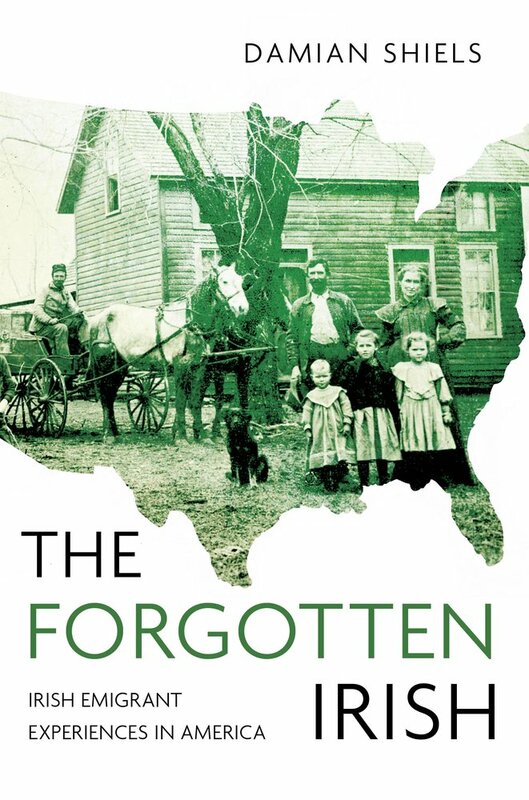 The Forgotten Irish is something of a companion work to Damian Shiels's earlier book The Irish in the American Civil War (2014). Though the title doesn't make it explicit, this study is also deeply connected to the American Civil War. From the description: "The research for this book has its origins in the pension records of the Civil War, which included birth and baptismal certs, medical records, and letters and private correspondence between family members. The treasure trove of material made available by the widows and dependent files comes, however, at a cost. In every instance, the file only exists due to the death of a soldier or sailor. From that as its starting point, colored by sadness, the author has crafted the stories of 35 Irish families whose lives were emblematic of the nature of the Irish emigrant experience." The family accounts are organized in the book using four themes. With the emphasis on the families of soldiers, the first two sections ('Wives and Parents' and 'Community and Society') utilize pension records to examine family emigration, financial interdependence, and both domestic and international connections. Social ills such as "indigence, alcoholism, domestic violence, and bigamy" are also highlighted by these sources. The last two sections, 'A Life in Letters' and 'A Death in Letters,' offer insights into the lives of Irish soldiers through their correspondence (frequently reproduced in the text). The final section examines how those at home dealt with the news of a loved one's death. Also, check out the author's excellent website Irish in the American Civil War: Exploring Irish Emigration & Irish Involvement in the American Civil War. The Stones River volume will be followed shortly by Decisions at Second Manassas: The Fourteen Critical Decisions That Defined the Battle (January 2018). Instead of battle narratives, the series titles (which also feature original maps and a guided battlefield tour) "focus on the critical decisions, those decisions that had a major impact on both Federal and Confederate forces in shaping the progression of the battle as we know it today. Th(e) account is designed to present the reader with a coherent and manageable blueprint of the battle’s development. Exploring and studying the critical decisions allows the reader to progress from an understanding of “what happened” to “why events happened” as they did." • Civil War Pharmacy: A History (Second Edition) by Michael A. Flannery (SIU Press, 2017). Reading the numbers thrown around in the early part of this book, it becomes clear that the Civil War sparked a colossal expansion of the pharmaceutical industry. Most of the organized antebellum drug manufacturing was concentrated in the North, but regulation was apparently pioneered in the South, with a handful of states there passing laws before any northern ones had similar public protections on the books. 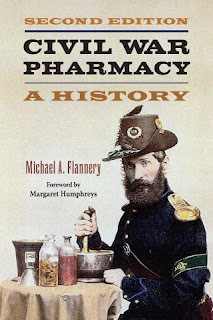 Michael Flannery's Civil War Pharmacy "is the first book to delineate how the growing field of pharmacy gained respect and traction in, and even distinction from, the medical world because of the large-scale manufacture and dispersion of drug supplies and therapeutics during the Civil War. In this second edition, Flannery captures the full societal involvement in drug provision, on both the Union and Confederate sides, and places it within the context of what was then assumed about health and healing. He examines the roles of physicians, hospital stewards, and nurses—both male and female—and analyzes how the blockade of Southern ports meant fewer pharmaceutical supplies were available for Confederate soldiers, resulting in reduced Confederate troop strength. Flannery provides a thorough overview of the professional, economic, and military factors comprising pharmacy from 1861 to 1865 and includes the long-term consequences of the war for the pharmaceutical profession." The Second Edition incorporates new scholarship while also adding two new chapters on battlefield pharmacy and naval pharmacy. In my estimation, Blue & Gray for most of its run and early North & South sit together at the pinnacle of popular Civil War magazines. While N&S had fallen to such depths for so long that I was indifferent to its ultimate demise, I truly regretted Dave Roth's May 31 announcement that B&G was shutting down the presses. I was moving seemingly every year or two in the 1990s (changing your mailing address with magazines was a nightmare in the pre-internet age), so I picked up all the issues at bookstores that decade and have been a faithful subscriber since the beginning of the millennium. I think the magazine really came into its own when the decision was made to concentrate each issue on a feature historical article and General's Tour (when that exactly came to be, I don't recall). Happily, the quality of both also steadily increased over time. The maps in each issue were often better than anything found in published books and were often worth the cover price alone. In his post, Roth cites declining subscriber base numbers post-Sesquicentennial as one of the driving forces behind the decision to close shop, but I can't have been the only person to notice that the magazine itself was regularly slipping up on its own obligations. For some time, I suspected that we weren't getting the promised six issues per year. Going back only two years, I found that I received five issues during calendar year 2015 and only four in 2016. It became instantly apparent that no catch up was in the offing, and this year was projecting out even worse, so the end did not shock me. But enough of that. This moment should be more celebration than post-mortem. Really, we shouldn't feel sorry for the Roths. They got to experience, for more than three decades (and make a living out of it), the kind of Civil War dream that many of us might only fantasize about. That is a remarkable run. They, along with Robin, created an utterly unique niche-within-a-niche print magazine that will undoubtedly never be replicated. Hopefully, Dave and Jason won't feel bitter. One would think that, over time, feelings of pride over their legacy will surely replace the sadness. For me, as one of those 'who still hears the guns,' I will hold onto my B&G issues forever. Among them "C. David Dalton on the death of Felix Zollicoffer at the Battle of Mill Springs in Kentucky; Roger Durham on Robert E. Lee’s leadership early in the war of the Department of South Carolina, Georgia, and East Florida; Brian S. Wills on Abraham Buford’s behind-the-scenes contributions to Nathan Bedford Forrest’s famous exploits; the late Nathaniel Cheairs Hughes Jr. on the achievements and failings of Gideon J. Pillow; James M. Prichard on John Hunt Morgan and his “last Kentucky raid”; and Keith S. Bohannon on Edward C. Walthall, a Virginia lawyer who overcame his lack of prior military experience to become one of the ablest generals in any of the war’s theaters. Some essays offer full biographies of their subjects; others focus on a single campaign." I will be sad to see this one go. I guess four western theater and two T-M volumes was a pretty good run. 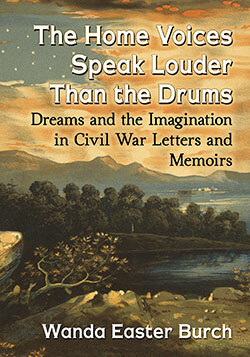 • The Home Voices Speak Louder Than the Drums: Dreams and the Imagination in Civil War Letters and Memoirs by Wanda Easter Burch (McFarland, 2017). From the description: "Providing fresh perspective on the human side of the Civil War, this book explores the dreams and imaginings of those who fought it, as recorded in their letters, journals and memoirs. Sometimes published as poems or songs or printed in newspapers, these rarely acknowledged writings reflect the personalities and experiences of their authors. Some expressions of fear, pain, loss, homesickness and disappointment are related with grim fatalism, some with glimpses of humor." According to the author, dreams were a vital part of maintaining soldier and home front morale, though one might imagine the opposite being true as well. The book is a remarkable record of Civil War dreaming compiled from a large body of primary source materials. Chapters examine soldier dreams of home, friends, and family, as well as imagined worlds of martial glory, defeat, or death. The study also encompasses the dreams of war correspondents and artists, prisoners, chaplains, slaves, caregivers of the wounded, and families at home. Other chapters look at very common dream subjects like homesickness and presentiments of death. This is just a sampling of the book's range. 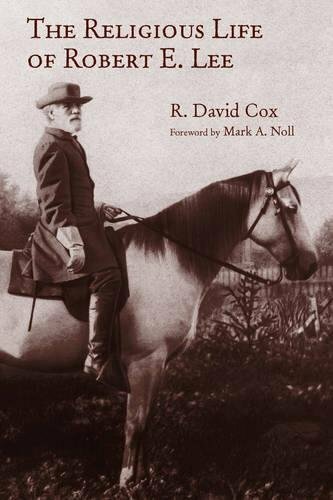 • The Religious Life of Robert E. Lee by R. David Cox (Eerdmans, 2017). Eerdmans is a specialty press for scholarly religious studies and The Religious Life of Robert E. Lee is part of their Library of Religious Biography series. Innumerable books and articles have commented on the role Christian faith played in Lee's life, but it is the primary focus of this full length biography. In it, author R. David Cox "shows how Lee's Christian faith shaped his crucial role in some of the most pivotal events in American history." More from the description: "Delving into family letters and other primary sources—some of them newly discovered—Cox traces the lifelong development of Lee's convictions and how they influenced his decisions to stand with Virginia over against the Union and later to support reconciliation and reconstruction in the years after the Civil War. Faith was central to Lee's character, Cox argues—so central that it directed and redirected his life, especially in the aftermath of defeat." Chapters cover Anglicanism in Virginia, the role of faith in Lee's household and extended family, the influence of William Meade (the Episcopal third bishop of Virginia) on Lee, faith's place at each stage of Lee's military career (antebellum and Civil War), Lee's confirmation, Lee on slavery, Lee's decision to resign from the U.S. Army, Lee's post-Civil War redirection toward peace and reconciliation, and more. It's a select bibliography so it's hard to get a solid first impression of the research, but it appears the author waded fairly deeply into the Lee family archives.